10Gb Etherner rozhraní pro notebooky. Dva RJ45 10 Gigabit Ethernet porty. 10GbE infrastruktura po standardní CAT6/CAT6a kabeláži (55/100m). Dva Thunderbolt2 porty (20Gbps). Řetězení až 6-ti dalších Thunderbolt zařízení. WIN, MacOS. Robustní hliníkové provedení s pasivním chlazením. With increasing demands for greater data transfer speeds and more bandwidth over shared networks, and with specialized applications such as HD video editing using high-performance shared storage systems, the deployment of 10 Gigabit Ethernet (10GbE) networking has skyrocketed. This high-speed wired networking standard offers ten times the performance of Gigabit Ethernet, the most common wired network connection included with most computers today, and yet, most computers aren’t equipped to get you connected. 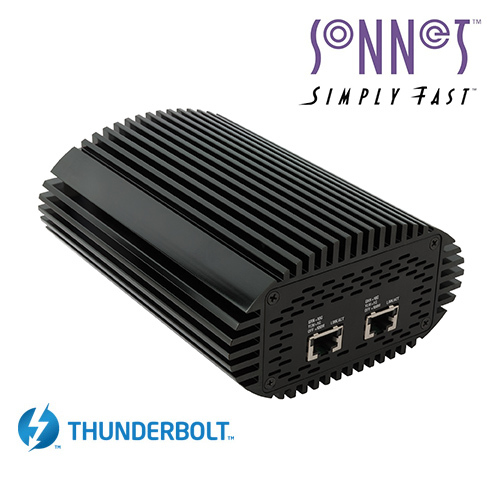 If you have a computer with a Thunderbolt port(1), Sonnet has a simple solution—the Twin 10G. This Thunderbolt-certified for Mac® and Windows®, 10GBase-T adapter is a powerful and cost-effective way to add 10GbE connectivity to your setup.